Some of the world’s richest Celebrities are lucky enough to be able to afford any foods they like. But when it comes to a healthy diet and natural weight control, they choose one of the oldest plant forms on Earth – a blue-green algae called Spirulina, which has been on the planet for over 3.6 billion years. Organic Spirulina is grown in lakes of pure, filtered water and is recognised as one of the most nutritious plants on Earth. In fact it contains over 100 Vitamins, Minerals and Trace Elements. Gwyneth Paltrow, Kate Winslet, Carol Vorderman, Gillian McKeith, Beverley Knight, Zoë Ball, Sophie Anderton and Jenny Seagrove are just a few of the many famous people who have discovered the benefits of Organic Spirulina. Oprah Winfrey takes Organic Spirulina as part of her ongoing weight loss programme, which has seen her lose 100 pounds. An insider reveals that the high vegetable protein and nutrient content in Organic Spirulina helps keep Oprah’s blood sugar level stable, her sweet tooth under control and her energy levels high. “Organic Spirulina is a natural, easily assimilated, complete protein. It's nature's highest source of chlorophyll pigment, rich in such Chelated Minerals as Iron, Calcium, Zinc, Potassium, and Magnesium, a fine source of vitamin A and B-complex vitamins, and it contains Phenylalanine, which acts on the brain's appetite centre to decrease hunger pangs, while also keeping your blood sugar at the proper level” says Dr Earl Mindell in his Vitamin Bible. Organic Spirulina is 65% vegetable protein and is one of natures’ best sources of Vitamins, Minerals and Amino Acids. It is also an excellent source of Beta Carotene, Vitamin B12 and Iron. It contains high levels of Chlorophyll, which is a good natural cleanser for the body. It is a low sodium food and is easy to digest. Which brand of Organic Spirulina should I buy? As with all supplements and foods, the purest Spirulina is one that is Certified Organic. All Seasons Organic Spirulina is the only one in the world to be Certified Organic by the UK Soil Association and also approved by the Vegetarian Society and Vegan Society. 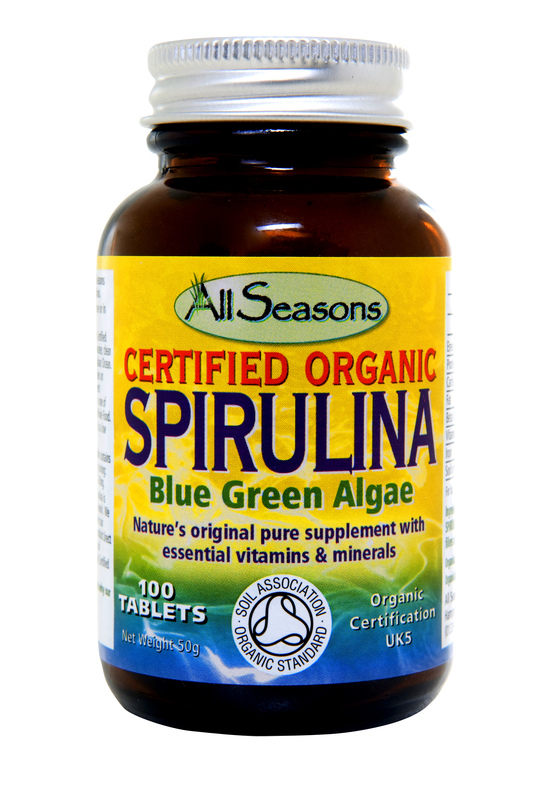 All Seasons Organic Spirulina is 100% pure, with no binders, fillers or additives used in either the powder or tablets. How do I take All Seasons Organic Spirulina? 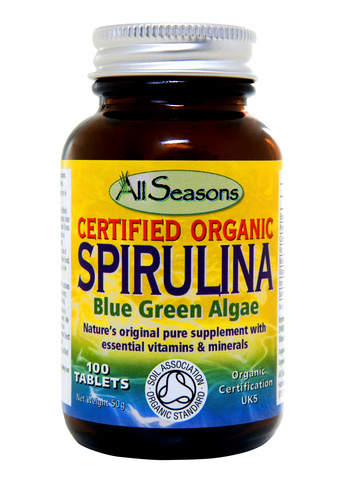 All Seasons Organic Spirulina is available in Tablets or Powder. Take 3-6 tablets per day (at one time or in smaller amounts throughout the day). Or take one heaped teaspoon of powder mixed in a blender with your favourite fresh fruit, fruit juice or soya milk. Where can I buy All Seasons Organic Spirulina? All Seasons Organic Spirulina is available from local independent health food stores, from all branches of Holland & Barrett and from selected branches of Waitrose. Also available direct from www.allhealth.co.uk or www.allseasonshealth.co.uk Cost: £9.95 for 100 Tablets and £13.95 for 100g Powder. (Also available in larger sizes). Please visit www.allseasonshealth.co.uk for more information. This press release was distributed by ResponseSource Press Release Wire on behalf of All Seasons Health in the following categories: Men's Interest, Health, Women's Interest & Beauty, for more information visit https://pressreleasewire.responsesource.com/about.